We miss our Maltese dog Buttons a lot, and didn't plan on adopting another dog until late in the summer, but Cricket (in photo) had other plans. Cricket is our new family member. She was rescued by a very nice Michigan group called WAG. The man who used her for breeding in a puppy mill had planned to drown her. Thank goodness she ended up with us. 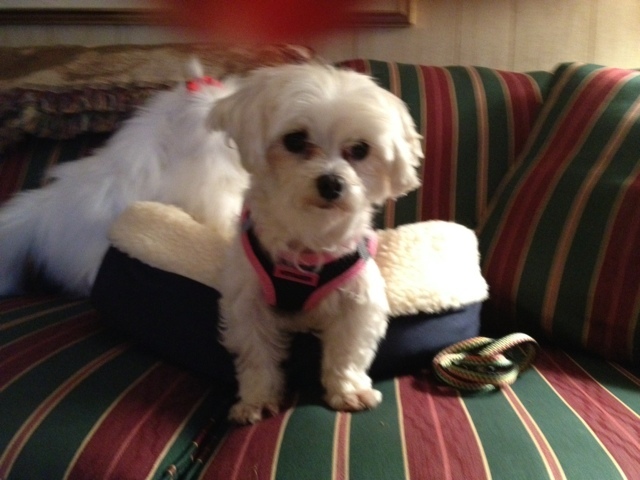 This little Maltese has been in a foster home since late March and her foster mother knew that the attention we could give the 5.4 lb. dog would be just what she needed. We have some work to do, but it was nice to see her soundly sleeping tonight while we were nearby yet not holding her. She is skittish and cringes as if she is going to be hit when we reach to pet or pick her up....so sad to see that. We'll get a schedule that works well for all of us. She does have a howl/cry when she misses us....sounds like a mini fire truck LOL! I highly recommend opening your home to the pet who needs you, and works well with your lifestyle.